Pins with items embellished with glitter are certainly popular on Pinterest whether it's in makeup, manicures, or craft projects. "Glitter is like the herpes of arts and crafts; you can't get rid of it no matter how hard you try." Mason jars were also very popular craft items that doubled as chandeliers, soap dispensers, organizing tools, and mini terrariums. Chevron geometric patterns are really trendy right now and can be found on everything from fashion to home decorating. On Pinterest, I've even seen burplap pillows and furniture slip covers. I just think that would be so itchy and not comfortable at all! I admit, I have a whole Pinterest board full of inspirational quotes. I thought this article was humorous because it's true. I spend a lot of time on Pinterest and I've seem many pins with these items. And I can also tell you, I've pinned my fair share of mason jar and chevron inspired projects, and as mentioned above, I have a whole board for inspirational quotes. Readers who left comments on the article seemed to think that the article was a bit snobbish. What do you think? Do you agree these items are overused and over-pinned? What would you add to the list if you could? Tell me! I'd love to hear your opinions. 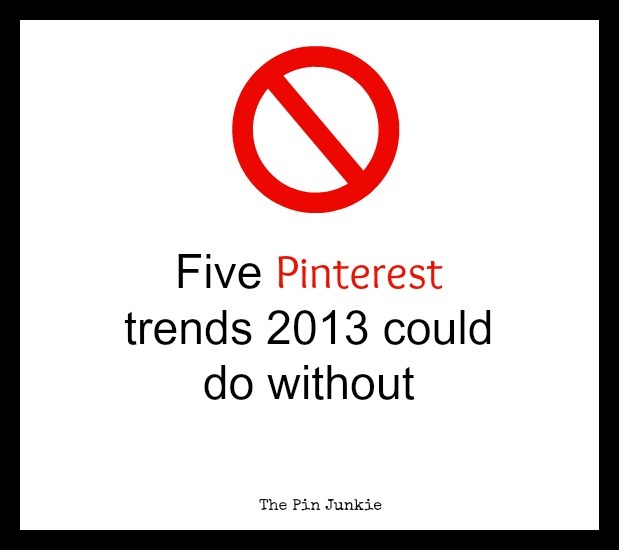 I agree, those trends were all around pinterest. My favorites are the mason jars. Stopping by to say hi from a blog hop! Who would put burlap on a chair??? I could totally do without that. I do have to admit that I like a lot of the mason jar crafts. I do too and I have several of them pinned. I have to agree with all of them but maybe because I am glittered impaired. Great idea! I'll remember that for my next glitter project! I don't think I'll ever get tired of glitter pics, but I agree about the Chevron. Oh and the mason jar thing is annoying. People act like they grow on trees or something. They aren't that cheap. Oh and a little burlap is ok, but a whole chair? Who would even sit on that? I agree with some of the comments that I like chevrons but the burlap chair - I don't think I could ever get on board with that! Interesting article. I actually like all of those trends, but agree some do go overboard. I also agree that I don't think I would ever cover a chair with burlap. I really shouldn't judge it because I wore hypercolor shirts and tight-rolled my jeans way past when it was fashionable. :) I'm your newest follower from the Handy Andy blog hop! The glitter and the chevron need to go now. Save the glitter for winter HOLIDAY crafting only please. Mason jars crafts/decor = good recycling. I like burlap as accent material. Oh shoot. On today's schedule, I was going to make glittery chevron mason jars with burlap lids! Hehe:) Just kidding! Thank you for bringing this to Whimsy Wednesday! Ha great post I agree wit the glitter...it just doesn't photograph well or something. Tired of mason jars too. Thanks for linking up on Made in a Day! 1-3, yes! Way overpinned. 4, I'm not sure. 5 can never be overpinned. I LOVE quotes.